I've been wanting to make some plush dolls and recently was focused so hard on my other dolls that I needed a break. 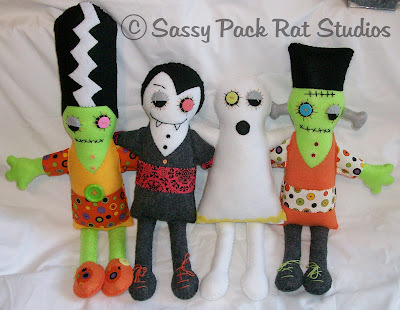 I had a design I did months ago so I set aside my Halloween dolls for a bit and cranked these out instead. 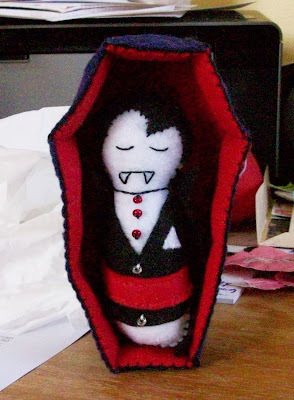 They are based on a design I did for a Vampire Dotee Doll swap I did last year. I had so much fun with it I wanted to do larger plush. The original design didn't have arms or legs but were pillow like but I decided to push myself further and make dolls out of them. I'm in love with them! There was supposed to be a witch and a Skellie but time got away from me so I might not do those this year. I did do a Ghost, Vampire, Frank and his Bride. Please let me know your thoughts on them. I'm thinking of re-doing the ghost. I made him first and I think he needs more detail. These will be OOAK and if they sell I won't make anymore until next year and they will be somewhat different. This is the Dotee Doll that inspired my design. I hope you enjoyed seeing my little creative efforts. Christmas is kind of screaming in my ear and I feel like I'm already late in starting that so more fun things are a coming! The vampire coffin is a spectacular touch with the Dotee Doll! Those are so cute! Definitely will sell out. I think the ghost is perfect. Ghosts don't have a lot of detail to them. These are really cute! Great job! Oh...and I like the ghost - I think the the simplicity works for it. I love them all! I think Frankie's wife is my fave! Halloween dolls are so fun!!! Your plush dolls keep stepping up more and more levels. I think these dolls are your best work yet. I love the mixed fabrics too. Loved how you designed their eyes. The ghost is awesome and I think it is perfect. Just like Finding Charm said ghosts don't have a lot of detail to them. They will for sure sell out! OMG! I adore them all! I've tried but I simply can NOT choose a favorite! So,so cute and adorable, thank you so much for sharing! I am hosting a giveaway over at my blog, come join! The Witch Doll is Done! Featured in 2 More Treasuries. Worktable Tuesday and A Witch. Peeks of Around The Studio Today.